If you've ever had to pay $3 (or more) to get your own money out of an ATM machine, you aren't alone. America's three biggest banks -- JPMorgan Chase (JPM), Bank of America (BAC) and Wells Fargo (WFC) -- earned more than $6.4 billion last year from ATM and overdraft fees, according to an analysis by CNNMoney that was verified by S&P Global Market Intelligence. 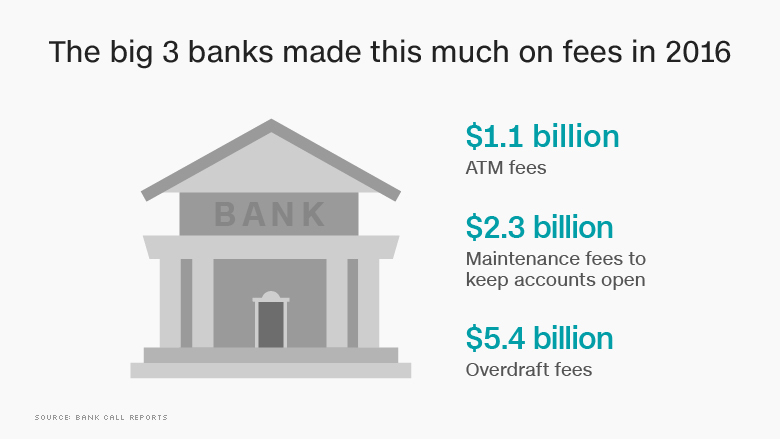 At JPMorgan alone, ATM fee revenue jumped a whopping 22% last year. 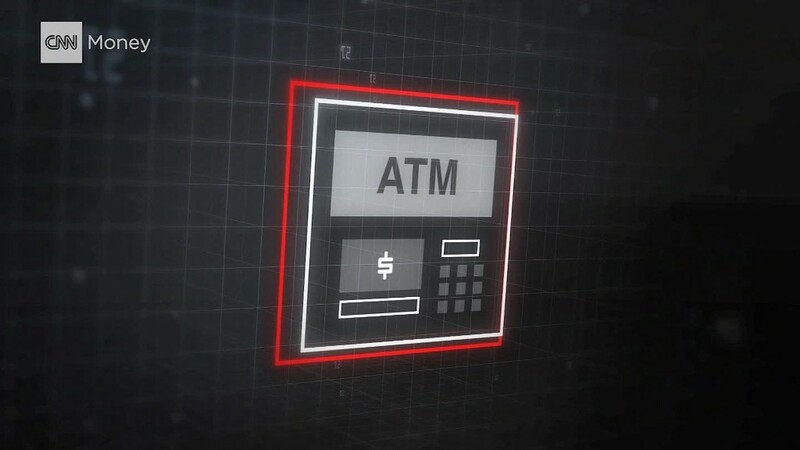 A JPMorgan spokesman told CNNMoney that's because the bank raised ATM fees by 50 cents at the end of 2015. Customers must pay the fee whenever they use a non-JPMorgan Chase ATM machine. "These fees have a disproportionate impact on low and moderate income families living paycheck to paycheck," says Pamela Banks, senior policy counsel at Consumers Union, an advocacy group. The average fee for using an "out-of-network" ATM in the United States is now $4.57, according to Bankrate. Last year marked the tenth straight year of increases. "It is unacceptable that Americans are paying a $4 or $5 fee each time they go to the ATM," Sanders said. While Sanders zeroed in ATM fees, banks make more money by charging customers so-called "maintenance" and overdraft fees. Maintenance fees are a monthly charge just to keep an account open. Some banks assess customers a few dollars a month if their account balance falls below a certain level, such as $5,000. Overdraft fees occur when a person's bank balance falls below $0 and they still take money out at an ATM or use their debit card to buy something. The bank is essentially giving people a loan, but the fees are hefty: Many banks charge $35 every time this happens. Customers aren't supposed to even be able to overdraft on their account unless they actively "opt in" to the service. But a 2014 Pew study found more than half of the people who overdrew their checking accounts in the past year didn't remember consenting to the overdraft service. Even more alarming is that 8% of customers pay 75% of all overdraft fees, according to the CFPB. Those customers tend to be young and poor, and they're overdrafting 10 or more times a year. "So-called 'overdraft protection' programs are really just a way for banks to bilk their most vulnerable customers with costly fees," says Banks. "It's just an unfair system," says Morteza Hamidi, a 54-year-old small business owner in Orange County, California. Hamidi claims he's paid a lot of those $35 overdraft charges in recent years. One time he deposited a check from a recent job he did, but it didn't clear. Hamidi says he bought small things like coffees the rest of the day before realizing the check didn't go through. His bank charged him $35 on each purchase because his account went below $0. He has since learned to monitor his balance vigilantly. "The amount of fees they charge should be proportionate to the fault," Hamidi says. The CFPB study notes that if someone borrowed $24 for only three days and paid an overdraft fee of $34, that "loan" from the bank would carry a whopping 17,000% annual percentage rate (APR).